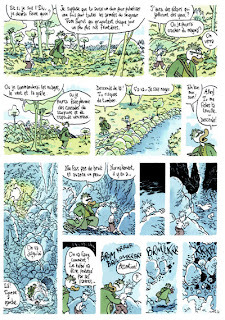 One thing that I don't think Lewis Trondheim gets enough credit for is just how dense and intricate his plots are. In his genre stories, he has a knack for telling "hang-out" stories pinned on impeccably and subtly designed plots. 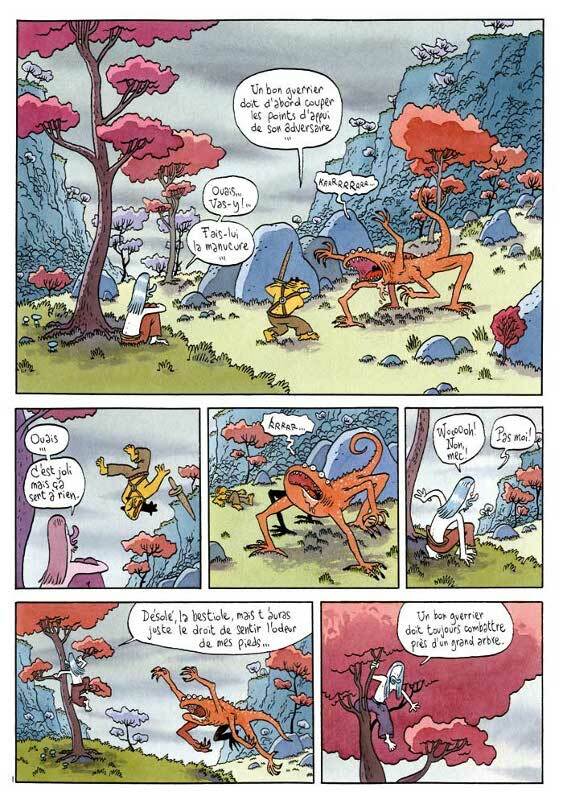 That is, his main characters seem to just be hanging out, cutting up, making mischief and generally behaving like idiots for page after page, until Trondheim suddenly tightens the knots on what seemed to be incidental details and pulls together a series of clever twists. 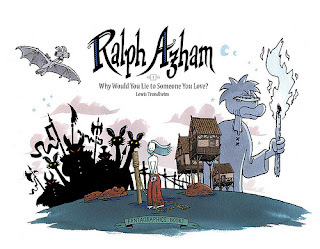 Ralph Azham is his newest solo series, after years of working on Dungeon with Joann Sfar. That series got so incredibly convoluted that I imagine Trondheim wanted a shot at a more conventionally-paced fantasy series that still contained his trademark mix of high and low humor. The story concerns the titular character who happens to be the village outcast, an especially cruel fate considering that he was supposed to be some sort of prophesied Chosen One who failed the final test as a child. As a result, he's pretty much loathed by everyone and plays up to that loathing with his obnoxious personality. Much like Herbert in Dungeon, Ralph is a classic Trondheim anti-hero. He seems to possess no redeeming qualities or abilities; his sole power seems to be the power to predict how many children someone will have. Also like Herbert, Ralph manages to rise to the occasion when things really get hairy. The story finds Ralph sentenced to be tied to a pole inn a pig sty after the flirty Claire kisses him, angering her father and brother. The blue-haired Ralph manages to make the best of his punishment as his father comes to him and brings him food. In the early going, no one appears to be more disappointed in Ralph than his father, who nonetheless keeps supporting him. Every person that Ralph meets winds up having some kind of impact on the story in a manner that is completely organic but frequently surprising. The little kid whose parents die after leaving the town winds up having some kind of powerful sonic scream. The village doctor/pharmacist winds up being complicit in an elegant cover-up. Ralph's dad is at once more caring and more diabolical than he seems at first. The "chosen one" plot rears its head toward the end of the book after a horde of invaders threatens to kill everyone in Ralph's small village, but with a series of unexpected twists. What's interesting about this book is that what starts as a seemingly lightweight exercise winds up going to some pretty dark places. Ralph winds up getting the power to see and talk to the dead, for example. The first evidence of this is the many fetuses he sees hanging around the village doctor, who specialized in brewing an abortive tea for unwanted pregnancies. As it turns out, spirits wind up hanging around those who killed them, a revelation that renders that scene both hilarious and cringe-inducing in retrospect. 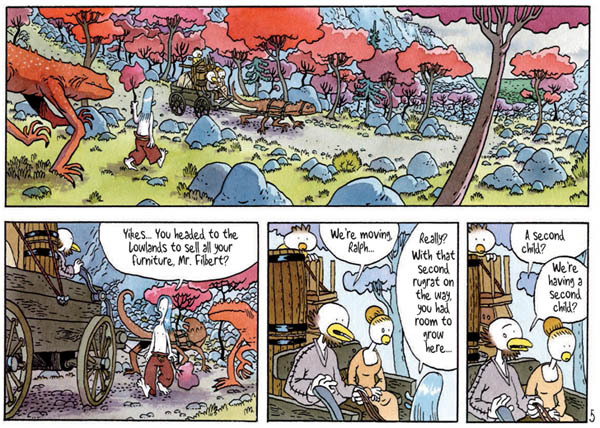 Indeed, there's plenty of what seems to be incidental dialogue as Trondheim flashes back to Ralph's failure and his father's role in it that winds up revealing everything. 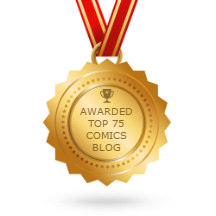 The book ends with a betrayal of trust and the promise of greatness on the part of both Ralph and his new, young companion. In many respects, this is a conventional first volume of a fantasy series: the character is introduced and his beginnings are explored, and his humdrum life is eventually transformed by a tragedy. The book ends with the quest just beginning. One is left wanting much more, yet Trondheim unquestionably delivers the goods in creating a compelling, memorable set of characters with dubious motives whom we nonetheless root for. It should be noted that Bridget Findakly's tasteful color choices not only make this book beautiful to look at, but also have an impact on the way the reader understands the narrative. Editor Kim Thompson transforms a book that was a 50-page album in the standard European style into a hundred page book by cutting each page in half, printing them in a landscape format, and recreating the gestalt by having the original component panels of the page face each other. 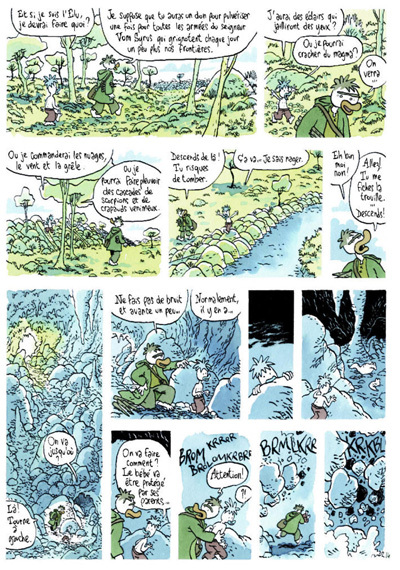 Trondheim is unquestionably the top genre comics artist in the world, which is amazing because he's also one of the top slice-of-life cartoonists, autobio cartoonists, children's cartoonists, gag cartoonists, experimental cartoonists, etc. 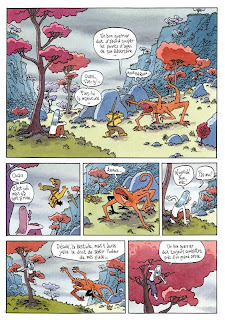 There's never been a cartoonist as versatile as Trondheim who was able to work on virtually any kind of project and certainly not one who could blend his funny animal-style into any genre.